...without needing to click "Run Query" or anything? Is there any way to get reputation from only answers? There is a reputation column, but I want to exclude the reputation collected from questions. How can I delete the old queries from my profile, which I no longer need? Query Results with the same parameters are cached for a week. In those cases you don't need to click the button Run Query. The query results are shown immediately. If the query isn't cached, there is no option to run the query with just following a link. In this case the button Run Query need to be clicked. Anonymous users also need to solve the reCaptcha before they run a non-cached query. You need to query the votes tables (votetypes 1 (accept), 2 (up-mod), 3 (down-mod) and 9 (bounty) are of interest. Not the answer you're looking for? Browse other questions tagged support reputation answers data-explorer . 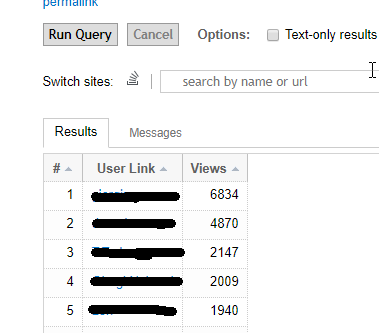 How can I remove queries from my data explorer profile?